[Weekend Poll] Do You Actually Read App Permissions Before Accepting? This is the latest in our Weekend Poll series. For last week's, see Which Is More Important To You In A Phone, Size Or 4G? Quite a simple poll this weekend, and one that requires little explanation: do you read app permissions before installing an app, or do you just install with reckless abandon? Sound off in the poll below and elaborate via the comments. 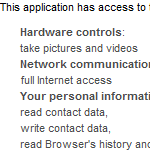 Do You Actually Read App Permissions Before Accepting? Yes. I'm pretty uptight about security all around. Yes. The Market is too much like the Wild West right now. Sometimes - depends on the app. No. I like to live life on the edge, baby!